I noticed some of the fairing rattling since I bought the bike. 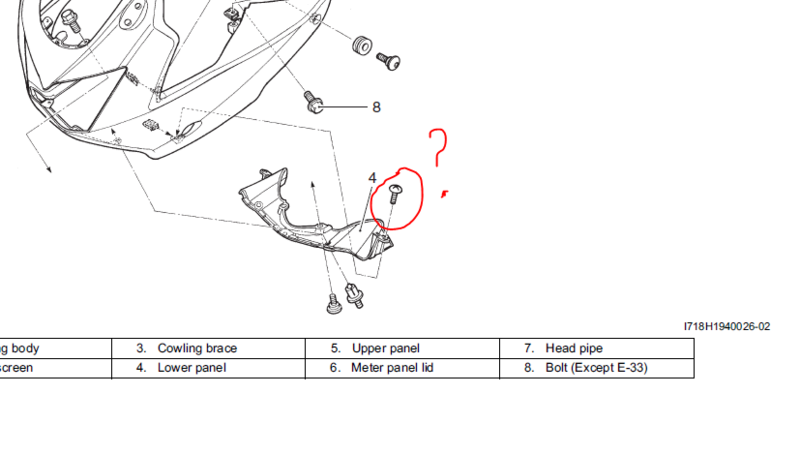 Today I had some time to investigate and have found that the following screw is missing? I think it might be the cause. Pulled the other side out and its not a regular screw (it was a pain to get out and I put it back in). Anyone know what its called or where best to get one? You could try your local nuts & bolts specialist store ( like fasteners australia or similar ) using the one from the other side as a sample , or just order one from your suzuki dealer. @paul wrote: You could try your local nuts & bolts specialist store ( like fasteners australia or similar ) using the one from the other side as a sample , or just order one from your suzuki dealer. Definately will do. Just wondering if anyone had the specs to save me pulling the other one again. My hands are a little too fat for that area! As Paul suggested, go to a nuy and bolt joint to get screws and things, unless it's a factory off set shank, that can't be bought anywhere else. Suzuki will probably charge you , anywhere from $2.50-$5 per screw. My local nut and bolt joint, (in Brisbane) sells screws for 20c. Suzuki will rip you off. That's how they make money. ...after market parts. I recently bought 10 stainless bolts....cost me $4, the equivalent from Suzuki, carbon bolt at that, was going to be $30. @mtbeerwah wrote: As Paul suggested, go to a nuy and bolt joint to get screws and things, unless it's a factory off set shank, that can't be bought anywhere else. Wow - they don’t miss you do they! Will try specialty fasteners first and go from there. Is it possible that the missing screw attaches to another part. My fairing is off and is in pieces at the moment, If you like I can snap a pic of the screw but it won't be until later today as I'm headed to the beach. @BanditDave wrote: Is it possible that the missing screw attaches to another part. That seems to be it if I google speed nut screw that what it looks like. Will try supercheap/bunnings and go from there. @rodent4 wrote: My fairing is off and is in pieces at the moment, If you like I can snap a pic of the screw but it won't be until later today as I'm headed to the beach. Thanks - I'll try bunnings first but if that fails I'll hit you up! Thankyou - will try local and if not order one in! Don't forget that those parts are open to the environment so you'll need something suitable if going aftermarket. @barry_mcki wrote: Don't forget that those parts are open to the environment so you'll need something suitable if going aftermarket. Good point - something corrosion resistant. I think it was around $26US for those. If you were placing a bigger order I don't think it goes up much if at all. I pulled it out and had a look, it's not a threaded screw it's a self tapper. If you go to Supercheapauto or Autobarn and have a look on the swivel stand that have bolts, nut's and whatnot you'll find what you're looking for. Champion Handy Pack No BH755 will get you out of trouble and looks similar. The original Suzuki screwhead doesn't have a ridge, it's more rounded. @rodent4 wrote: I pulled it out and had a look, it's not a threaded screw it's a self tapper. You’re a champion. Will hit up super cheap tomorrow at lunch. Done and done - it was exactly as said above a 10g self tapping screw. 60ish cents from Specialty Fasteners. Thinking it may the be aftermarket indicators? More investigation needed.